If you saw the amazing video I posted of my friend Briohny Smyth doing yoga in a video for Equinox fitness you will get a good laugh out of this “Equi-not” as he calls it yoga video parody by humorist Michael A. Stusser. To his credit also Michael gave an interview with magazine Well and Good in NYC which is totally worth the read in which he discusses the controversy surrounding the Equinox video with Briohny Smyth and give’s his take on the situation. For those of you too busy (or let’s be real…lazy) to click on the link above I’ll give you the short version of what he said to the people being negative . Just because she is wearing underwear doesn’t take anything away from how beautiful and talented she is or how amazing the video is. Yoga and Fitness Streamed LIVE: CNN Gives Yogis Anonymous a Shout Out! Anita Avalos enjoys yoga via Yogis Anonymous at home! I was so stoked to see Yogis Anonymous get a mention on CNN for their LIVE streaming yoga classes! What could be better than fitness and yoga brought to you in the comforts of your own home? CNN gives a shout out to streaming LIVE online classes, because let’s face it watching the same ‘ol DVD gets pretty darn boring! I grew up in the sticks where the nearest yoga studio or gym was a good 30min drive and the few class times they offered were either the wrong level inconvenient times for me. Forget about getting to take from a variety of instructors and styles it was very limited as far as choices go. So there I was with my videos. Boooooorrrrring. I knew the tapes so well I would tell the jokes before the instructor…things were a bit stale to say the least! Another place I lived I would drive an hour and fifteen minutes to my yoga classes. Needless to say my yoga practice suffered. I couldn’t always make it to class so I would do my yoga at home. Unfortunately my home practice lacked enthusiasm and soon begun to feel like a chore. Flash forward to me now living in the yoga land of plenty Los Angeles a.k.a. “Mecca” so to speak for yogis everywhere. Interestingly enough I still find there are times where I am not able to make it to my favorite teachers/classes and feel so lucky to be able to do a fresh practice online with some truly amazing teachers! Wanna see something badass? Watch the video above of my friend yoga teacher Briohny Smyth doing an incredible yoga video for Equinox Fitness. This video is inspiring because it’s like watching two old people holding hands as the walk down the street, it shows love and commitment. I think maybe what inspires me the most however is that it shows a continual curiosity. Just when you think you’ve mastered one aspect of it, trust me you’ve only just begun. I often liken my yoga practice to a relationship. If you ever find yourself in a long relationship regardless of how amazing you or the other person is you will probably feel bored at one point or another. It makes me want to cringe just saying it, because part of me does not want to accept that to be true. However, the good news is, you don’t have to be. See, boredom is the assumption that there is nothing left to know, there is nothing new. This is never true. You can never know anyone completely, because they are always evolving with every breath. You just have to be curious. Dig deeper. The same goes for yoga, you will never know everything about yoga. In fact, the more you know, the more you know you don’t know. So cliché’ yet so true. Hopefully this video makes you peel back the curtain and be curious. Roll out your yoga mat and gaze at it like a newfound lover. Get curious. Yoga for the New Year: Try Something New this Time! Mackenzie Miller of The Hot and Healthy Blog doing anti-gravity yoga! Every time around this year, it never fails. You hear people talking about their New Year’s Resolutions and how they are going to stick to them this year. It is the same ole same, but why not try something new for a change. Instead of hitting the gym daily, and depriving yourself of chocolate and carbs, why not grab a friend and go to a yoga class. I know, I know, you are probably thinking, “but I can’t even do the splits” but that is why yoga is perfect for anyone. There are so many types of yoga that there is one out there for you. Trust me. Below I listed three alternative forms of yoga to help get the ball rolling. One fun alternative is AcroYoga. This form of yoga combines acrobatics, healing arts, and traditional yoga poses to create a fun and balanced class. Since the poses are based on the effort of two people, it is a great way to set a goal with a friend or significant other. A “base” and a “flyer” perform aerial poses to rejuvenate the body’s energy and build/tone muscle mass. It fun class to take at the end of busy week when you want to let loose and have fun, while getting a good workout. Another great “end-of-the-workweek” yoga is laughter yoga. Though there is not much traditional asanas associated with it, the mental and spiritual effects are compared to the mainstream yoga. Laughter yoga is a great stress reliever and core-toner. It is sweeping studios and nursing homes by storm because it helps a person “let-go” or issues and boosts morale. Many elderly patients have adopted laughter yoga as well as people with aggressive cancer diagnoses, like a non-hodgkin’s lymphoma or mesothelioma prognosis. 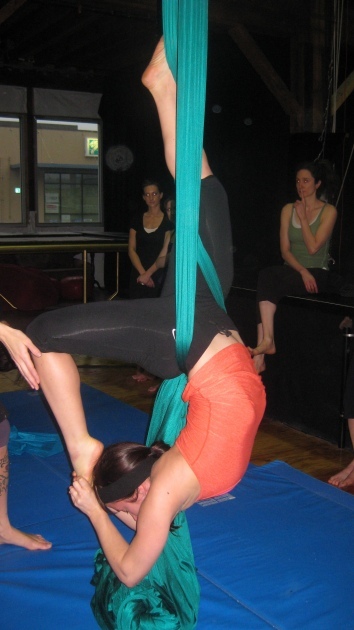 AntiGravity yoga is another form that is a fun twist to traditional yoga practices. Students get to perform poses hanging and stretching from a silky hammock attached to the ceiling. It is a very physically intense yoga and is a great way to really work that upper body, get tone and reenergize the mind-body connection. AntiGravity yoga combines Pilates, dance, calisthenics, and acrobatics with traditional asanas to create a fun alternative yoga. So as the New Year creeps up, try and set a goal that is not based on the gym. Yoga studios are always welcoming to new students. You will reach your goals while becoming a better you, inside and out.